Morecambe manager Jim Bentley has called on his players to maintain their recent good form at Yeovil Town on Saturday. The Shrimps head to Huish Park in search of a third straight league win and fourth in all competitions. 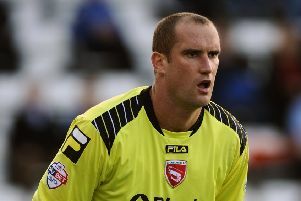 Following the opening day defeat at Grimsby Town, Bentley’s squad rallied with a League Cup win at Rotherham followed by three points against Blackpool and Portsmouth. “It’s a long trip but we have to keep our run going,” Bentley said. “Yeovil have a relatively new manager but they have some good players and they finished last season strongly. “They’re a decent club and I like going there. It’ll be a tough game but I’m sure their manager is telling their players the same. Tomorrow’s opponents began their season with victories against Notts County and Walsall. Since then, however, Darren Way’s players have drawn with Luton Town and lost to Mansfield Town on Tuesday. Following a spell as first-team coach, Way took charge of the Glovers last season after Paul Sturrock was sacked at the start of December 2015. Having been in trouble at the foot of the table, Town pulled clear and eventually finished 19th, two places ahead of the Shrimps. Bentley’s players will be looking to make it three straight league wins against their hosts after doing the double last season. A 4-2 win at Huish Park in September was followed by a 2-1 victory at the Globe Arena in mid-January. “It was a fantastic game down there,” Bentley recalled. “We were two down, it could have been three but the sending off (Shaun Jeffers) changed a lot and we were excellent after that.